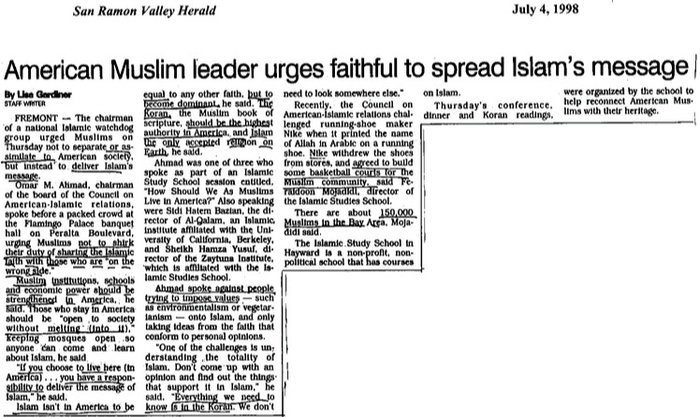 As reported by the San Ramon Valley Herald, CAIR Chairman Omar M. Ahmad told a crowd of California Muslims on July 2, 1998, "Islam isn't in America to be equal to any other faith, but to become dominant. The Koran . . . should be the highest authority in America, and Islam the only accepted religion on earth." Ahmad now denies making this statement, calling it a "false and pure fabrication" on the reporter's part. In a press release CAIR claims it "is seeking a retraction" from the San Ramon Valley Herald. That's not surprising, given what a problem this quote has been for CAIR. But what do you know? The intrepid Art Moore of WorldNetDaily.com did a little investigating and learned from the editor of the San Ramon Valley Herald that the paper "has not been contacted by CAIR"; the city editor also confirmed not having heard from CAIR. Dec. 11, 2006 update: In the four years since I first made available the Omar Ahmad statement quoted above, it continues to make waves. Ahmad denies having made it, the journalist who quoted him, Lisa Gardiner, sticks by her story, and other Muslim organization criticize CAIR for its attitude. Art Moore of WorldNetDaily.com reviews the situation today with a long account at "Did CAIR founder say Islam to rule America?" In addition, I should belatedly like to acknowledge that the clipping from the San Ramon Valley Herald cited above and posted on my website - the basis for all subsequent discussion of the Ahmad quote - was made available to me in late 2001 by the Rev. Austin Miles of Oakley, California. He had noted it in 1998 and, knowing of my interest in CAIR, sent it to me to make use of.